Want to up your pleasure experience? “Slow is fast and less is more” is a sure-fire way to up your pleasure quotient. But don’t just take my word for it. Try it on! I practice this way of being in the bee yard. Woe betides the person who rushes into the bee yard with an agenda full of busy doing. Those fuzzy little girls will quickly bring you up short every time with a painful wake-up call to mind their ways as you enter their space. You have to attune to their ways. As you approach the bee yard, if you pay attention you’ll feel the point when you enter their space. It’s usually about 8 feet from the hive. I always stop and ask permission to enter, and then I take a moment or two to notice my feet on the ground and to settle my breath. I’m slowing down and becoming open to the special space. Their space asks me to be conscious of my movements, of my own energy. Am I frazzled or calm, open and curious or fixated on “what needs to be done”? When I go slowly and pace my actions, things go well. This is a relationship with the bees, not a job. 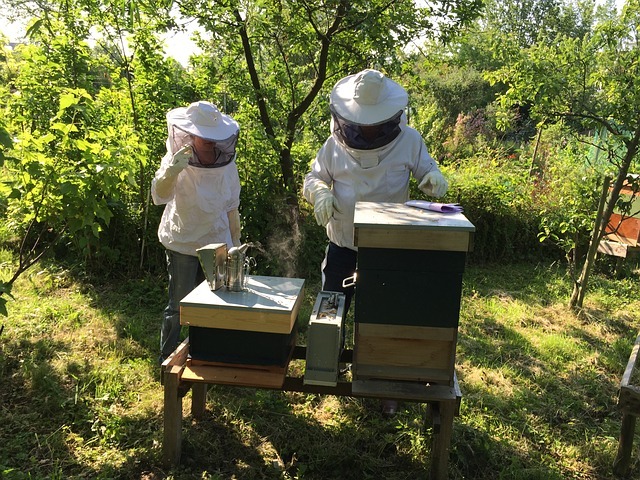 When I take the two top covers off to reveal the inner sanctuary of the hive, the first thing I notice is the calm, followed by the intensity of the experience – up to 80,000 bees per hive when it’s in full season – but the prevailing mood is calm. When attuning with that, my whole system settles down. Bees have a reputation for being busy, but you never get the feeling of hurriedness or rushing with them as they go about the many tasks needing attention in the hive. There’s an order and confidence that resonates from them. It draws out a methodical pace in me – a mindfulness practice to be sure. There’s so much pleasure in doing just one small task at a time – no rush, no hurry, settling into the experience. As I go slowly I soften into the beauty and sensual pleasure of the hive – its smells, sounds, and warmth. They wander on my hands and fingers, tickling me with their fuzzy little bodies, as they curiously check me out. When back in my regular life outside the bee yard, I carry these lessons with me. It’s the metaphor of the hive – busy but never harried. I remember the pleasure that comes with slowing down, doing one thoughtful thing at a time, my full attention on the task at hand, savouring and getting lost in the sensuality of the moment. Join me for a learning experience of bees! What the Bees Know on Sunday, June 19th, 2016, 9 - 4:30 p.m.